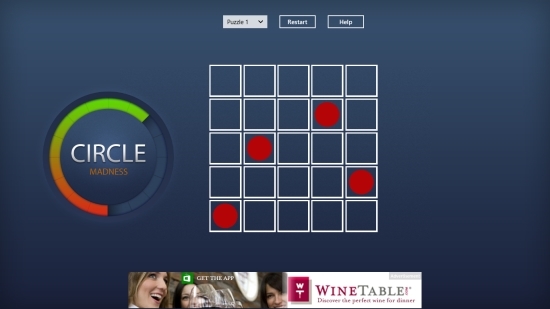 Circle Madness is a free Windows 8 Puzzle game app in which you have to fill squares in a grid by directing a circle. It is an easy to play yet interesting game with as many as 30 levels in increasing order of difficulty. 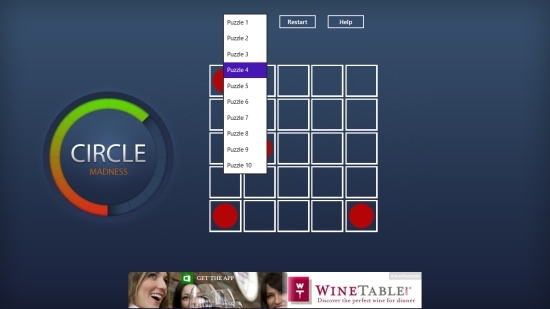 This free Windows 8 Puzzle game app is a single screen game with easy game controls. You just have to tap in the squares of the grid to direct a green circle so as to fill all the squares. You will also find a few red circles placed in some squares that will block your way. Try to escape these circles and turn your direction away from them. You can start with initial levels that are easy and gradually move to the difficult ones that consist of larger grid with more number of squares. A good thing about this game is that all the 30 levels are open to play. So, you can select any level that you like and start playing it. Circle Madness is freely available in Games category of Windows Store. You can click on the link given below at the end to view the app directly in Windows Store. Let’s see how to play this Free Windows 8 Puzzle game. Circle Madness is a nice game to kill your free time. The interface is quite clean and sharp. As you land on the app’s Start screen, you will see a grid consisting of empty squares and a few red circles placed randomly in some squares. Above this grid, three options will be located: Puzzle Number, Restart, and Help. Since all the 30 levels are open to play, you can select any level that you want to play using the Puzzle Number dropdown. The Help option will briefly describe how to play this game. You can use Restart option to reset the grid and start your game again. Once you select a level to play, tap in an empty square to start from there. A green circle will appear in that box. Now, as you tap in another square, all the empty squares in between will automatically get filled-up. Similarly direct the green circle till you fill all the empty squares. Keep in mind that the red circles are there to block your way. Thus, you will need to turn your direction away from these red circles. Similar games: Jigsaw Puzzle Games Kids, Block Puzzle Free, Plumber3. Circle Madness is a simple Puzzle game app with easy game controls. The advantage is that you can select among 30 levels and start playing the game. Try it and tell us how you feel. Do share your feedback with us via comments.